This 3-acre site is bounded by Fayetteville, Brant, Lawson and Concord Streets with approximately 17 feet of elevation change. An underground stormwater control structure was designed to double as detention and an amphitheater. The Fayetteville Street entrance is marked with entrance seat walls with brick veneer, campus identity signage, street trees and decorative landscaping to create a prominent feature into campus. Along the Brant Street corridor, a future pedestrian link was designed to connect the new west campus to the main campus. 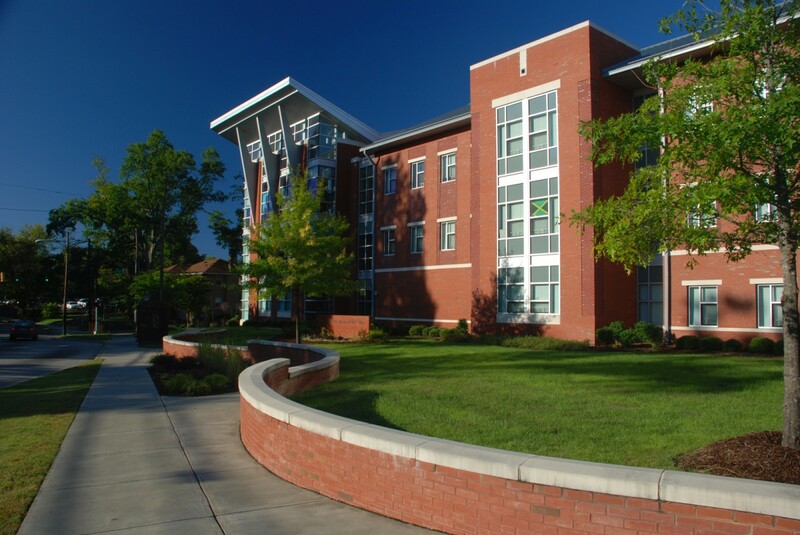 An outdoor courtyard designed for students provides terraced lawns, specialty paving nodes, a full stage equipped to handle large events, decorative lighting and landscaping. Stewart also performed special inspections. Originally, special inspections were to be performed by the design team. However, the owner requested that Stewart perform these duties. Since our inspections team was not involved until a few weeks into construction, an immediate assessment of as-built conditions was performed. Several major deficiencies were noted. In an effort to ensure that all existing masonry and concrete deficiencies were repaired, Stewart’s inspection team made several recommendations to the owner and the project team. Some of the problems that were observed included missing steel reinforcement, improper mortar installation, the use of frozen materials during construction and the ongoing construction of masonry in standing water. Stewart’s involvement resulted in corrections being made to deficient items in a timely manner, as well as implementation of best practices for installing the structural systems. In the end, the owner received the quality that was expected and should have been present from the beginning. The State Construction Office has used the “lessons learned” as a training tool and example throughout North Carolina.